Clapham Pioneers meets once a week on Tuesday Night at 7:15pm at Wingate Square (SW4 0AF). There are usually 40 – 60 people who come along and members and non-members are all welcome. At 7:30pm we head over to Clapham Common for an instructed group warm up, runners then have the choice of three running options, a shorter 5km/3Mile run for beginners, a longer route or a coaching session. There are changing facilities and lockers available at Wingate Square but please bring your own padlock. Post run, it’s off to the pub to get to know your fellow Pioneers. Long routes and coaching sessions vary each week and options are announced in advance via the weekly Pioneers email. To find out more about joining the club, look at the membership page. If you are a non-member, you MUST complete the non-members disclaimer form before attending your first session. This is a good route for beginners or those want to run a shorter distance; the route takes you around our beautiful common and through the charming Abbeville Village back to base. Take a look at the route here (Map). 6miles / 10k (Map) – this two-bridge route takes you along the river on Chelsea Embankment and back through the beautiful Battersea Park. 8 miles / 13k (Map) – be a tourist in your own city as you take in the Thames on this beautiful route passing through Parliament Square on route to a riverside stretch past the iconic Battersea Power Station. Each week we offer coaching sessions, focusing on strength, endurance and speed, led by one of our four UK Athletics trained coaches. The first Tuesday of the month is your chance to challenge yourself with our 5k run in Battersea Park. We run this route at the beginning of every month and we will time your run, which you can compare with other Pioneers. Pioneers only has one official club night, Tuesday. 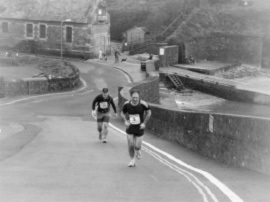 However the club is a great way to meet other local runners. Many of the club members have met training buddies to go out with on other nights or at the weekend, especially when training for a race. Please click on this link for a risk assessment of all Clapham Pioneers running routes. All members and non-members of the club are kindly requested to familiarise themselves with the club rules and abide by them at all times. Every person attending the club must take full and complete responsibility for their own actions. Know your limits. If you require any special assistance, it is your responsibility to notify run leaders and/or volunteers. The club may not be able to fulfil your special requirements. Clapham Pioneers running club was set up in 2008 by Tim Slee, son of Ian Slee, a passionate runner who ran not to break records or be the fastest but for the love of running and inspiring others to do the same. 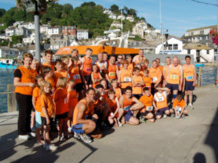 In 2007 Tim’s father Ian set up a running club in his hometown of Looe, Cornwall: Looe Pioneers. Tragically Ian lost his life to a brain tumour and in tribute to their inspirational founder Looe Pioneers incorporated Ian’s initials in lower case into their club logo PiONEERs. Tim Slee set up the Clapham Pioneers running shop and associated running club in memory of his late father, but after a number of years of tough retail trading the Clapham Pioneers shop shut its doors in 2012. Clapham Pioneers running club still operates and is now run by a group of volunteers, and despite the shop’s closure Ian’s legacy lives on in Clapham. Clapham Pioneers in an entirely not-for-profit organisation and all membership fees and invested directly into the club and its members. We remain to this day the only running club in the heart of Clapham. Watch out for our distinctive orange vests dashing around the common, join us and help a legacy live on.